AppliTek is uniquely poised to perform commissioning and start-up services as well as the accompanying trouble-shooting and problem-solving activities, normally as a part of a design/build analytical project that has been factory accepted (FAT). The Start-up and Service team is coordinating the commissioning in the field and assuring a smooth transition from us, the manufacturer to you, the customer. 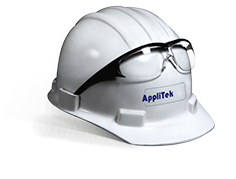 What are the essential elements of AppliTek’s start-up and commissioning tasks? During the course of commissioning the analyzer system, operators are closely involved and educated on the system’s measurement principles, the start-up procedures, the day to day operation and finally general troubleshooting and servicing. Besides tailor-made start-up services for our bigger turnkey analytical projects, it is also possible for AppliTek to assume the commissioning of individual analyzers. In that case, a qualified AppliTek engineer comes to your site, if necessary in presence of our local distributor, for efficient connection of all utilities and sample lines, and bring the analyzer on-line until the first measurement data come in.